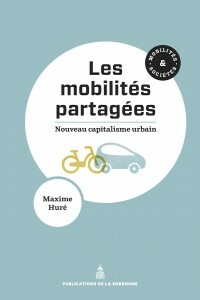 The association VIGS is pleased to inform you of the publication of Maxime Huré’s book, in the collection Mobilités & Sociétés of the Publications de la Sorbonne. While Paris and Lyon will renew the contracts of self-service bicycle devices in 2017, this book questions the urban transformations caused over the long term by the emergence of shared mobility implemented by large globalized private firms. – To what extent does the participation of these new actors in urban mobility policies transform the role of public institutions in urban management? – Can these mobility systems meet the ecological challenges of the 21st century? – What are the winners and losers of these recompositions in the transport economy, urban social institutions and structures? These questions are analyzed from the recent development of self-service bicycle and car-sharing systems (notably in Aix-en-Provence, Amiens, Bordeaux, Grenoble, Le Rochelle, Lyon, Marseille, Nantes, Paris , Rennes, Rouen, Strasbourg) by proposing a more general reflection on the place of capitalism in mobility innovation and in the city’s factory. The book makes it possible to grasp the contours of new collaborative economies by questioning the “public-private” governance of shared mobilities. Created in 2011, VIGS (Innovative Cities and Knowledge Management) is an organisation offering expertise in the fields of territorial planning policies, transport and energy issues. VIGS aims to advise public and private decision-makers, publish specialised studies, educate stakeholders, expand knowledge and contribute to ongoing research. The fruit of a multi-disciplinary collaboration between young researchers, VIGS enlists political and social sciences as tools for decision-making, implementing procedures and participatory research, as the basis for the training of policy-makers and company executives and as tools for the cultural mediation and enhancement of urban heritage.